For the last several months, the team at PickleballMAX has been busy in the laboratory preparing for several product launches that we believe will be extremely beneficial for the pickleball addict. With each launch, our goal is to, simply, create a product/services that will, ultimately, help pickleball players enhance and maximize their picklebility – their ability, passion and addiction to the sport. For our first product launch, we created a product specifically for the pickleball addict. This product will allow you to track all things pickleball – including your improvement/progress, paddles, shoes, tournament results and more. This is also a product in which – each month – you can conveniently write down your goals and detailed action steps required to achieve these goals. It’s a product that you will want to refer to each day of the year. 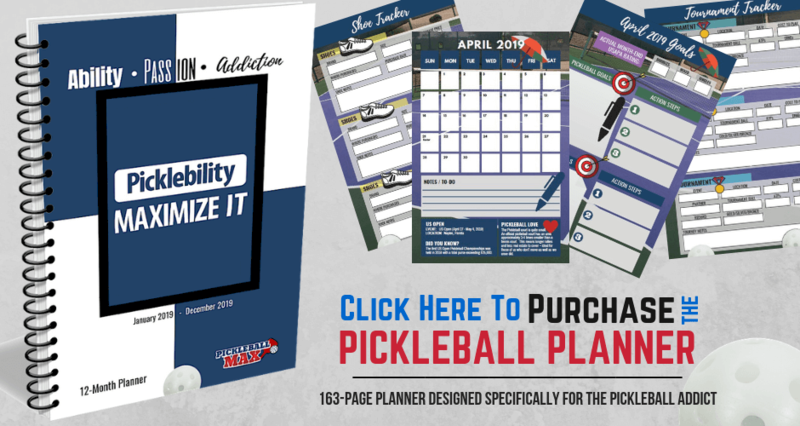 Move over, Franklin Planner — the Pickleball Planner is designed specifically for you — the pickleball addict! 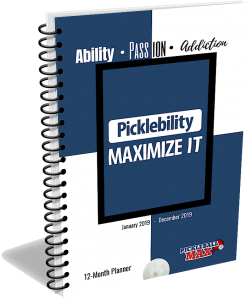 This 12-month (January, 2019 – December 2019) 163-page pickleball planner is designed and created to help you improve your pickleball game and stay focused and motivated throughout the year. Most importantly, the pickleball planner will help you achieve your goals – both on-and-off the pickleball courts. With weekly calendars designed specifically for the pickleball addict, you are able to easily track important information about your rec games and drilling sessions, lessons and clinics. Armed with this information, you will better be able to improve your game and objectively analyze areas needing improvement. Loaded with weekly motivational quotes as well as helpful health, strategy, club, safety, DIY and tournament tips for any level pickleball addict. Includes gear (paddles & shoes) tracker, tournament tracker, venue tracker, weight tracker, product recommendations, rules clarifications and an all-important resources page. Includes a checklist of technique fundamentals for the dinks, drops and drives (groundstrokes). Sized (6″ x 9″) to keep conveniently in your pickleball bag so you can refer to it often. Happy planning! See you on the courts.